28th July 2014 – Having just missed an individual medal when finishing fourth at last years World Championships, Kemar Bailey-Cole (JAM) did not miss out this time as he stormed to victory in the final of the mens 100m and was crowned Commonwealth Champion. Having won his semi-final with ease Bailey-Cole looked the man to beat and despite not getting away to his best start he was able to power his way past the field to take the title in 10.00 seconds. 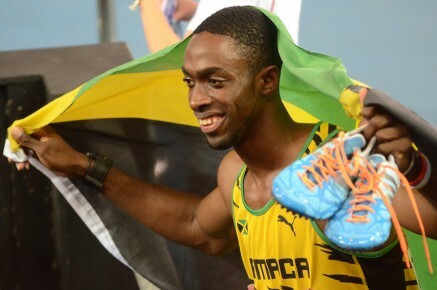 Kemar has peaked at just the right time running his fastest times of the season at the championships. In the womens event Schillonie Calvert (JAM) looked imperious winning her semi-final in 11.08 but unfortunately was not able to replicate that form in the final and finished fifth in 11.21. During the morning session there was an outstanding qualification run from Hellen Obiri (KEN) as she broke the Games Record for the womens 1500m running 4:04.43 to win her heat. She will be joined in the final tomorrow evening by Jemma Simpson (ENG).